StressMyPC is suitable as a stress test at the overclocked graphics card to get the GPU to crash if the GPU frequency is set too high! You must not test the overclocked graphics card with extreme games, or other software to bring the GPU to crash. In general, you can any graphics card overclock by 10% to 20%! If the graphics card is not suitable for the new frequency, it comes after 10 seconds paint stress via StressMyPC to crash of the graphics card! Then the operating system must be restarted! With new graphics cards, there is a auto-protect device, that automatically set the default frequency! When testing the GPU, please disable (turn-off) the CPU and HD test! (... see Image-1 Arrow-3) and activate only the paint-stress. (... see Image-1 Arrow-2) and start the stress test (... see Image-1 Arrow-1) . It is also important that the StressMyPC window is maximized, so fills the whole screen :-)! See also: ► With the stress test, load only the graphics card, how to? (Image-1) Stability test for the overclocked graphics card! 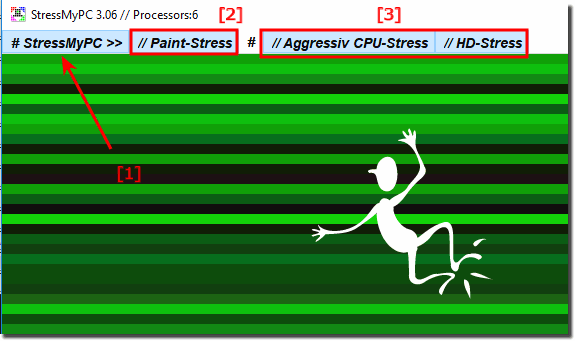 StressMyPC - FAQ-2: Can i use this stress test for the overclocked graphics card (GPU crash)?